I’ve been dreading today’s high temperature since I saw the forecast Monday morning. Cracking 100 and it’s only early July? I can’t believe I’m saying this but I’m actually missing the summer where I whined about wearing fleece. It doesn’t matter if the temperature breaks 100 or it hovers between 80 and 90, when it’s hot and humid, my runs suffer. I’m hot from the get-go—and that’s true if it’s a race (ahem like the unseasonably hot Chicago Marathons we’ve had recently) or a training run on the lakefront. I can’t stay cool to save my run and I’m so drenched by the time I return home you’d think I walked into Lake Michigan with my clothes on. But lately I’ve had some help from Pearl Izumi in the keep-cool department. I’ve been sporting the company’s In-R-Cool tank since we first started seeing temperatures in the 80s back in March (and to think I’d welcome a week of that weather right about now). Designed with technology that’s aimed to cool you down more than heat you up, even after you’ve been pavement pounding when the sun is scorching, and fabric that would cool your skin while managing moisture, I figured it’d be my best heat defense, especially in March when I wasn’t even close to accustomed to the warmer weather. But the big question was: would it really work? My answer: yes. This tank wicks the sweat away from my body, it’ll be drenched but I won’t be. And it’s been acting like that since I first wore it almost four months ago. It has managed to keep me cool—and not just because it’s sleeveless, armed with a white back panel, and incredibly lightweight. I swear it’s that special fabric, which amazingly hasn’t succumbed to my stinky sweat yet. I ran without it on yesterday’s scorcher of the 4th of July—I swear it felt like it was 100 degrees at 8 a.m.—only because I couldn’t find it in my laundry heap. When I went with an old standby, I seriously thought I was melting. Rumor has it that it’s only going to get hotter so I’m hoping that my husband accidentally picked it up in his laundry and I’ll have it for my next run. How could I grow so attached to one tank, I don’t know, but I did. 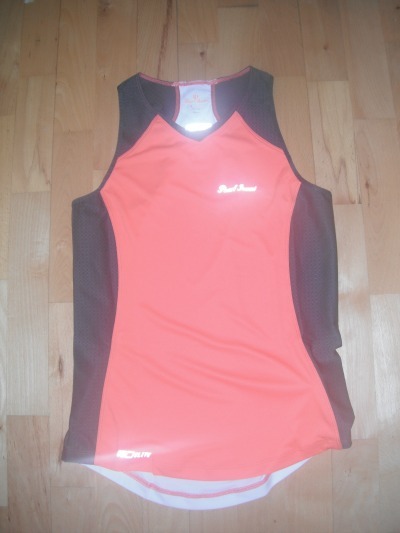 The funny thing is that until recently, I’d never think of Pearl Izumi has having running gear that I’d like. I’m armed with an arsenal of cycling stuff from arm and toe warmers to jerseys and jackets, and always associated the company with cycling and triathlon. That was a big mistake on my part. Because not only do I miss this tank on hot summer days when I’m not wearing it, but I can’t get through a treadmill workout without wearing the Streak II shoes. It could all be mental—or it’s that the minimal design actually works for my foot more than I thought it would. Whatever the case, I’ll take it. And to Pearl Izumi: now I know not to skip straight to the cycling gear on my next shopping trip. What are you wearing to keep cool on your summer runs? For a long time I have been wearing my beautiful and stylish ultracor yoga sets for the yoga practice. The clothing is super soft and it is very durable too. I am so happy that I invested in this brand. My cousin was a big fan of their clothing so she had suggested this brand for me.